1979 Airstream Excella 24' Exhibit "A"
The outside pictures were taken at Top of Georgia Airstream Park. 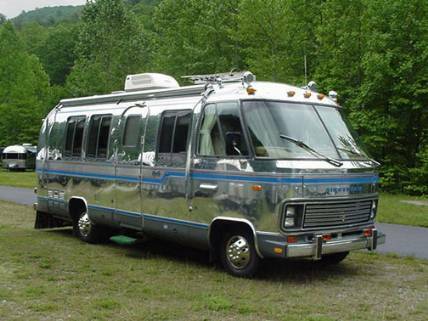 This polished 1979 24 foot Airstream Excella Motor home is in very good condition. 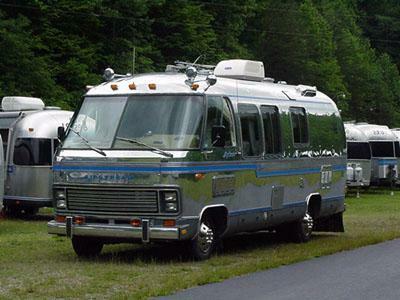 The unit features a gasoline powered Chevy 454 engine, new automatic transmission, manual air bag suspension system; all mounted on a Chevrolet P-30 Motorhome chassis. A directional spotlight has been added along with two Air horns to give it a "big rig" appearance. Also, a vehicle towing package has been added. All systems "GO." A central 30 gallon LP gas tank supports a four burner gas stove/oven, water heater, gas/electric Norcold refrigerator/freezer, and Suburban central heating system. 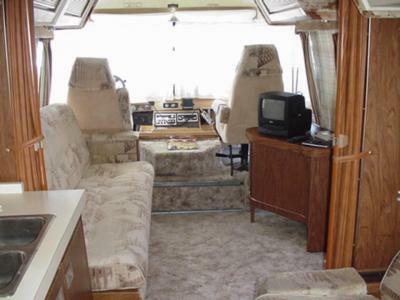 The Onan 4KW generator provides 60 cycle, 120 volt, 30 amp power for the overhead Carrier Air Conditioner; electric TV antenna system, and the ever so popular Airstream Stereo Entertainment System with AM/FM stereo radio and eight track tape player. A Cobra CB radio has been mounted on the console also. In the forward compartment, the floorplan features the pilot and copilot seats; one sliding, foldout table that will accommodate four; one sleeper sofa with lower storage compartments, and of course overhead storage bins, a TV table and storage cabinet. 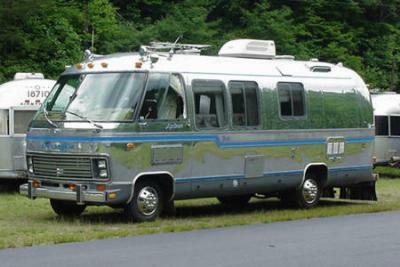 Unfortunately, the unit did not have the Airstream swivel chair. The center compartment is bordered two accordion doors that can enclose the galley and rear bath. The galley features twin sinks with twin doors cabinets and three drawers underneath; a filtered water dispenser, a wall-mounted spice rack, overhead stove ventilation fan, and a original Nutone Food Processor unit in the countertop. 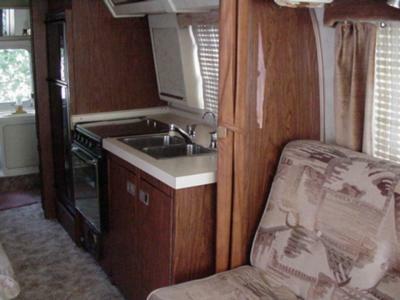 Directly across from the galley is a sleeper sofa with a small wine keller within the armrest, and storage compartments underneath, an overhead reading lamp, and the Airstream System Status board in one of two overhead storage compartments. 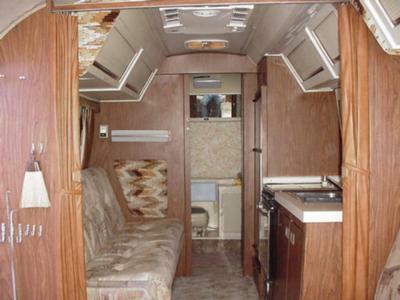 The rear compartment consists of a shower, toilet, medicine cabinet, sink with overhead mirror and cabinet underneath. The area includes two full length clothes closets, and one utility closet with the main fuse box and a central vacuum system inside. Two disappearing solid doors with full-length mirrors on each side slide out to meet in the middle for maximum privacy. Thanks of Lee Mumford ('LeeMo' on AirstreamForums.com) for the pictures and information!